Listening to Colin Murphy, special education teacher at Wheaton North High School, describe the impact of the “Alphadesks” he purchased with his grant dollars from the Student Excellence Foundation in 2017 is a story of transformation. “Alphadesks” are movable desks that can be changed to a stand-up desk from a regular, seated desk. They include an attached swing bar at the bottom of the chair that lets students swing their feet back and forth. The grant Colin received allowed him to purchase 10 of these desks for his classroom. He teaches special education students in a variety of subject areas including English, math, social science and instructional living during the school day. The choice these desks provide his students with disabilities addresses their need for movement and sensory opportunities. Sitting still is not always an option for many students and these desks provide them the opportunity to stand and/or move when he or she feels the need to do so. Movement is crucial to learning for these students. Colin said the biggest impact that the desks provide is the increase in his students’ focus level: they are more engaged. The desk offer a seamless in-class transition for a student who needs to move for learning. The desks allow each student to decide when and how to move giving them a greater sense of ownership and autonomy in their learning. 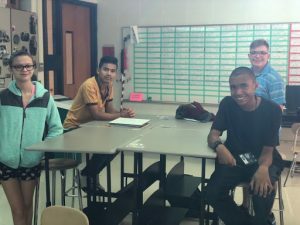 Colin told the story of a student who two years ago needed to get up every period and walk out in the hall; since the desks arrived he no longer leaves the classroom but uses his desk for his movement needs. An example of the importance of flexibility in the classroom.